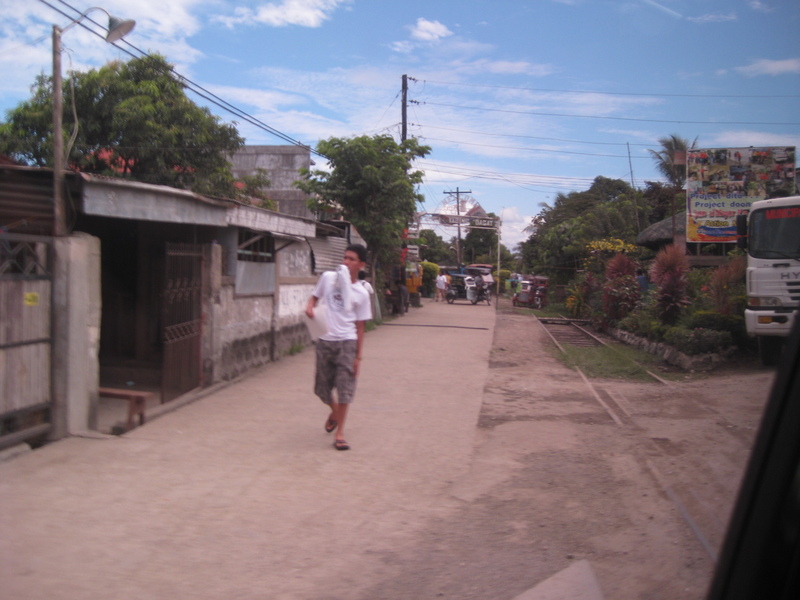 Following are a few more photos from a trip to Naga City back in 2009. 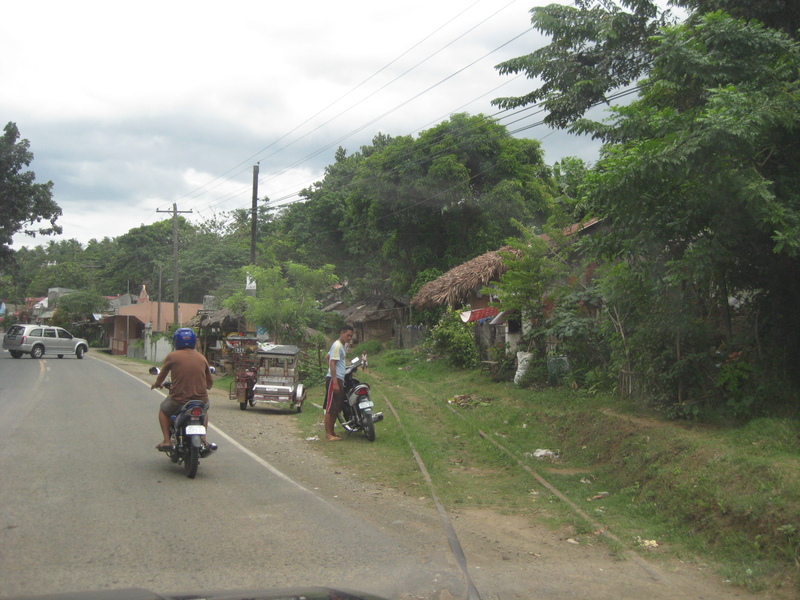 These photos take off from a previous posting where I featured the tracks of the PNR’s Main Line South, mainly what a traveler may see along the national highway en route to Naga City. Many of these tracks were not being used by any trains at the time due to a suspension of services after an incident a few years back when a Bicol Express train was derailed somewhere in Quezon. Most of the tracks one will see here have already been rehabilitated as the PNR has resumed the service between Manila and Naga City. In fact, they have taken advantage of the long weekend for All Saints’ Day (Undas) to promote the Bicol Express service that now features sleeping cars. The approximate travel time between Manila and Naga is 12 hours. 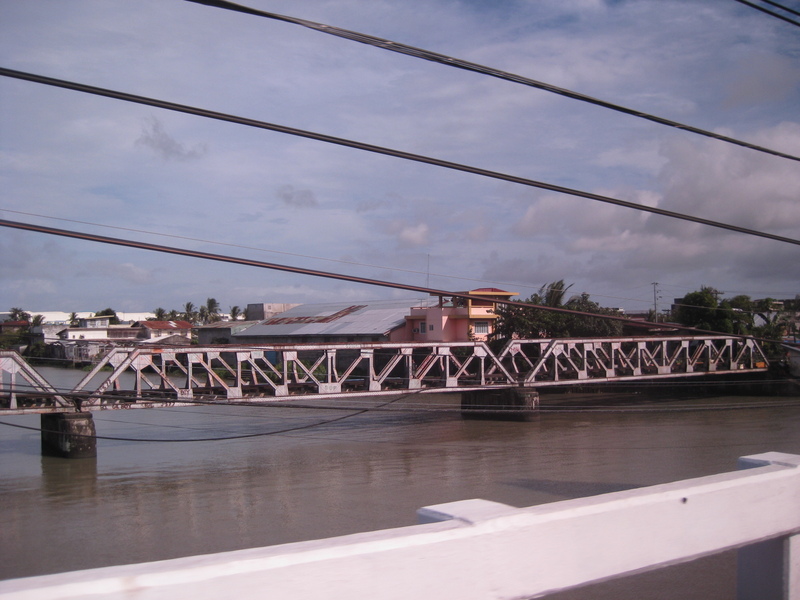 A railway bridge in Naga City – note the classic steel truss design that was the mainstay of most PNR bridges. 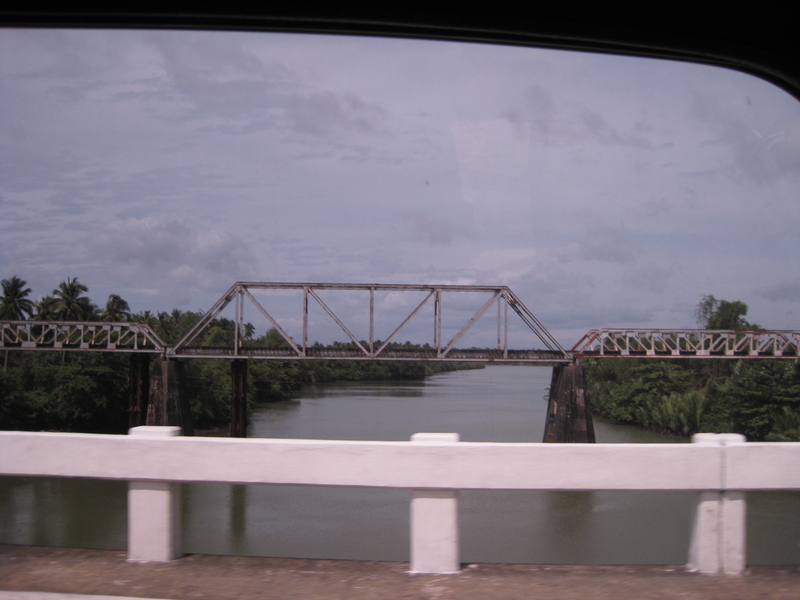 Another steel truss bridge – this one I photographed prior to the provincial boundary with Quezon province. 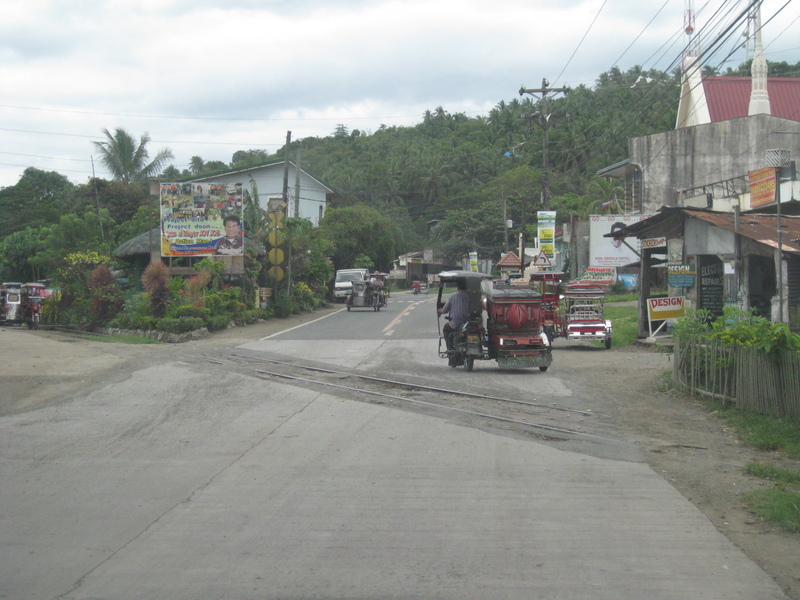 Rail junction along the national highway – this junction is located in the town of Gumaca. The signs are already obscured by tree branches and electric poles. At the time, one could see the state of neglect for the tracks as they are practically covered by dirt that transforms into mud during rainy days. 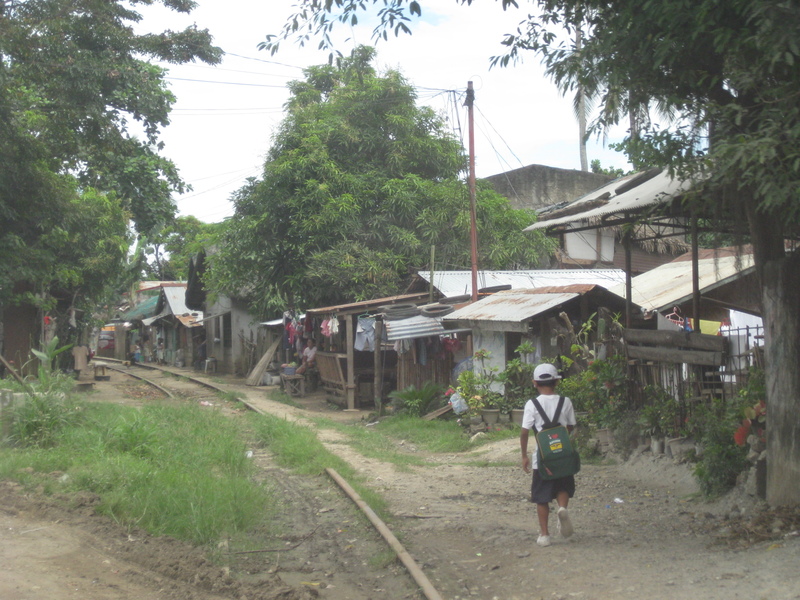 The railway tracks parallel to a barangay road – many sections again appear to be covered by dirt and growth. 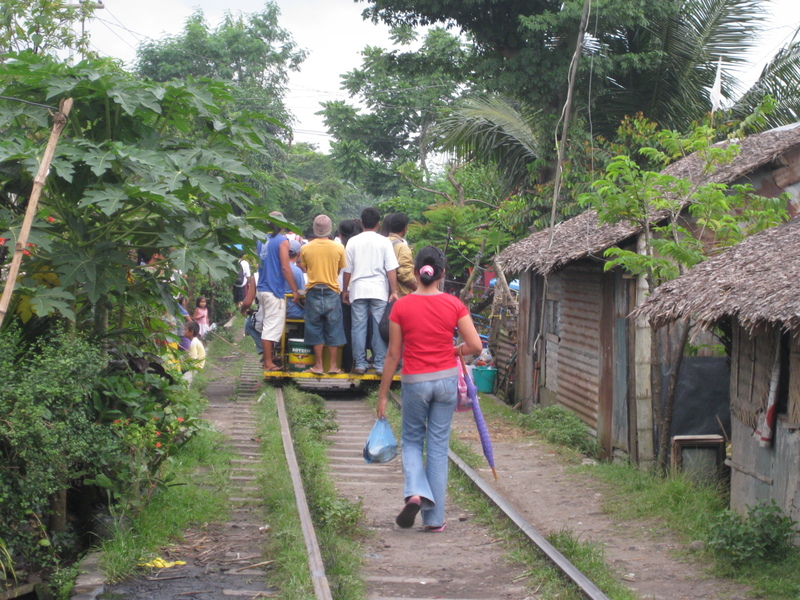 A tricycle is parked atop the tracks, probably waiting for passengers on space that is being used as a shoulder with respect to the local road. As communities have access to local roads, there are no trolleys here. Neglected railway tracks – note the grass growing along the tracks and covering the rails. Also, from the looks of it some ties seem to be missing or just buried in the dirt. 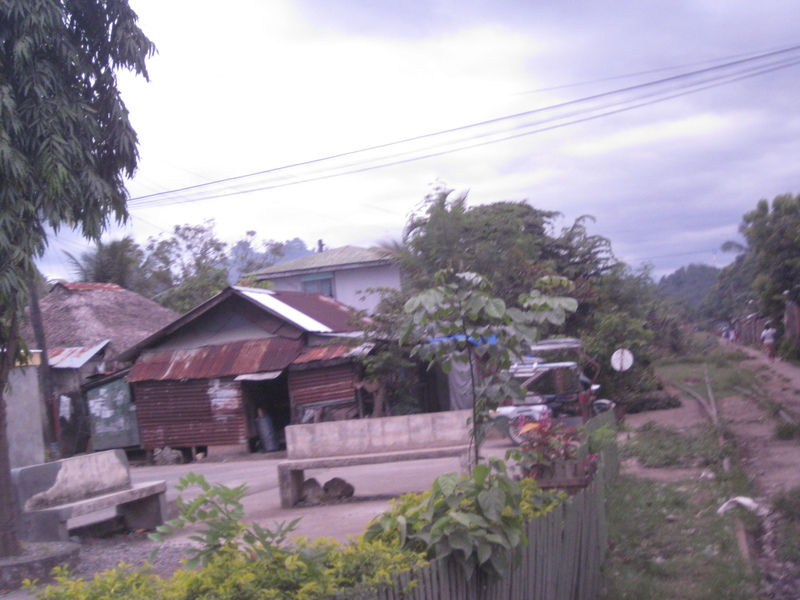 Many houses and shanties are obviously within the 30m ROW of the PNR. Such situations create a high risk for untoward incidents should rail services become regular and more frequent. 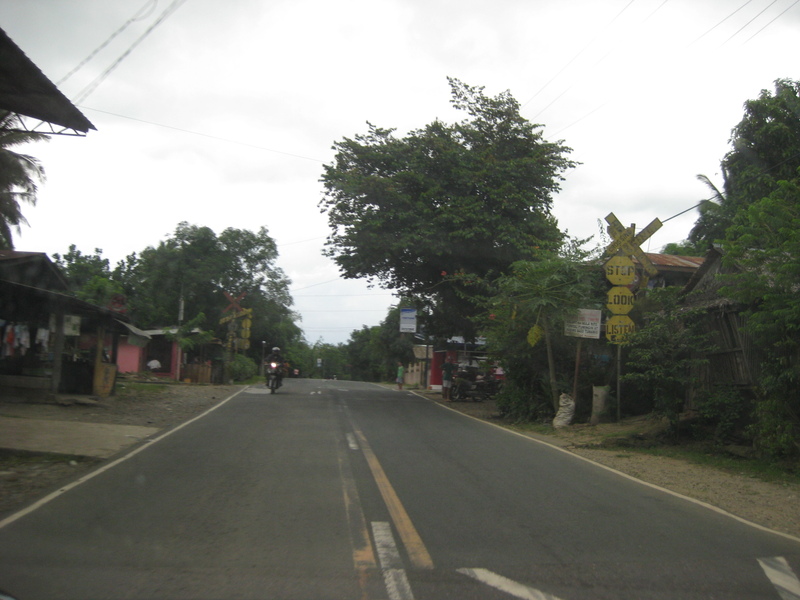 After my talk at the Ateneo De Naga, we went around the city to have a look at its roads and transport. As we had already seen the previous day that there were motorized trolleys in that city, we made it a point to visit one informal terminal located at a junction. 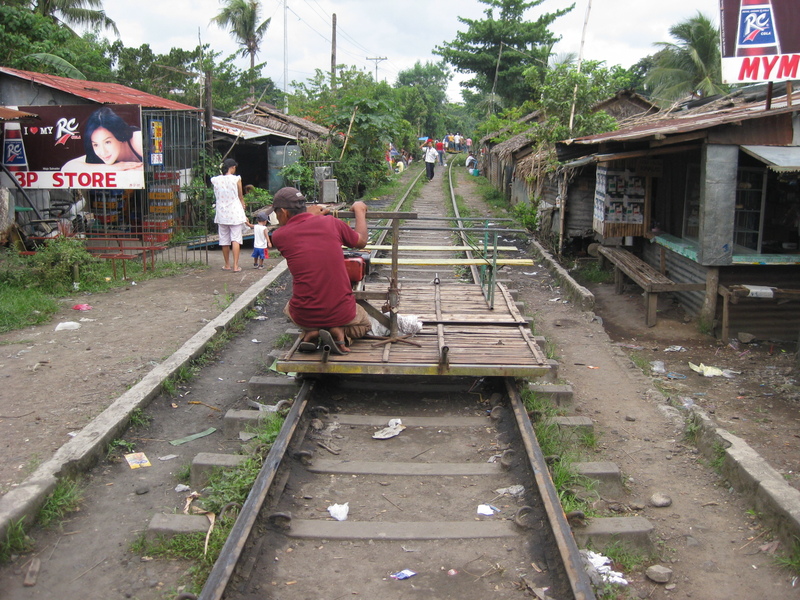 The following photos are a documentation of our taking a closer look at informal rail transport in the Philippines. Taking a closer look at the motorized trolleys of Naga City – our driver Roy speaks to two drivers/operators of the trolleys to ask them about operations. The trolleys are not so much different from the one we saw along the road while traveling through the towns of Quezon Province and certainly look like their relatives in Manila. They are made of light but sturdy bamboo with the occasional metal parts and some have makeshift couplers in case two or three are connected to form trains! The trolleys even have benches to allow for a few seated passengers. Passenger mix – the trolley service is popular to different users including students and laborers. They are cheap and the most practical (direct) mode of transport to their home, which are located along the railway line. Note the concrete ties for the tracks, indicative that this section has already undergone rehabilitation in the past when the old wooden sleepers were replaced by concrete ties. 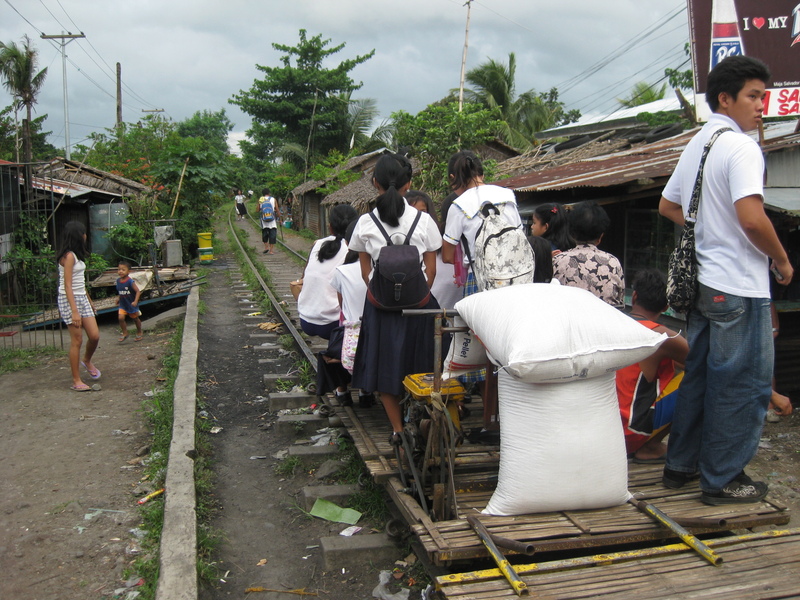 Informal freight transport – goods like rice and flour are also transported using the trolleys. I assume there are also stores in communities along the tracks and that the most convenient way of transporting commodities (paninda) would be via this mode. 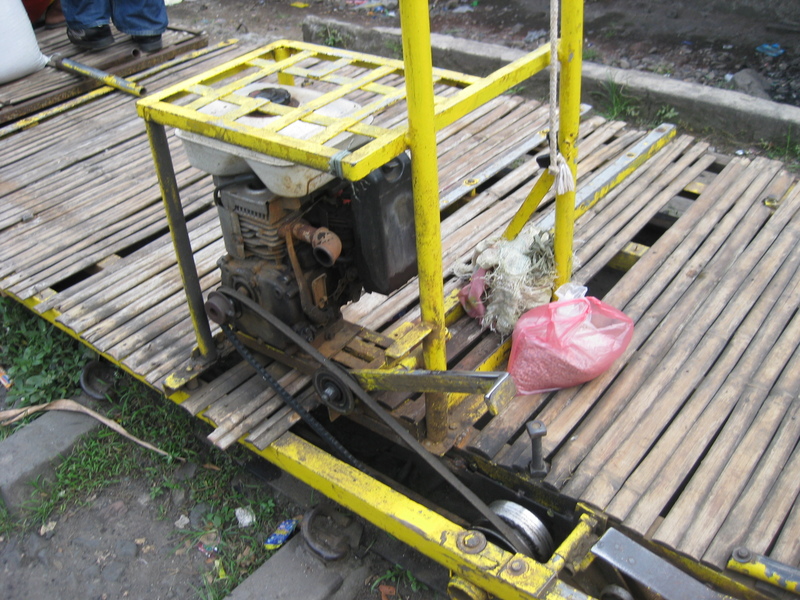 Motor power – while most if not all the trolleys in Manila are human-powered (partly because they should be light enough to lift in case trains do come given the increasing frequency of PNR commuter line services), the Naga trolleys use motors similar to that being used by boats. 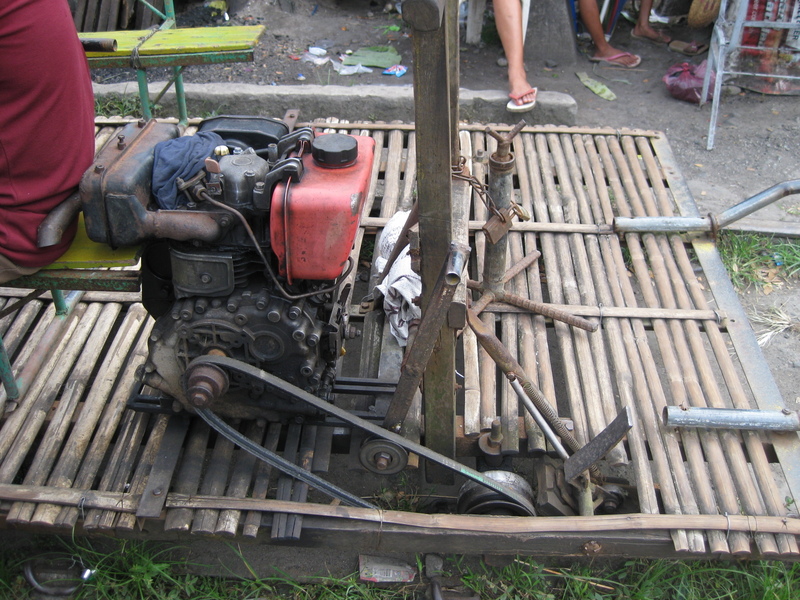 Driving wheel – while trains may be powered by locomotives, the trolleys have motors typically used by pumpboats and by the tricyboats found in the Visayas and Mindanao (tricycles powered by the same motors). The driving wheel is connected to the motor to move the vehicle and the contraption on the lower right and just beside the driving wheel is the brake mechanism. Thus, the driver is usually positioned just behind the motor where he has access to both the motor and the brakes. Fully loaded – a single trolley can carry as many as 25 passengers depending on their weight and size (more if there are many children in the mix). I think there are about 24 passengers on this trolley about to depart from the informal terminal. Off they go – with a full load and each person paying 10 pesos for the ride, the driver can earn about 200 pesos for one run or 400 for a roundtrip. Operating costs are quite simple including fuel and maintenance costs. On a typical busy day, a driver can have about 5 round-trips. Note how close houses are to the railway tracks. Next in line – the driver of the next trolley positions his vehicle and waits for passengers. We estimated it took something like 15 to 20 minutes to get a full load during the afternoon peak period when we were at the informal terminal. It would probably be longer during the off-peak periods. A view of the tracks on the other side of the road – we learned that the area along the tracks is not served by the trolleys. I can imagine that with the resumption of the Bicol Express service between Manila and Naga City, the people operating the trolleys would eventually have to deal with more frequent arrival of trains. Currently, the PNR services would probably pass through the trolleys’ service areas during the night-time so there will be very limited conflict at present. However, further rehabilitation of the Main Line South and the resumption of services all the way to Legaspi City should already serve as a notice to informal rail transport and the concerned local governments that the days of the trolleys are numbered. 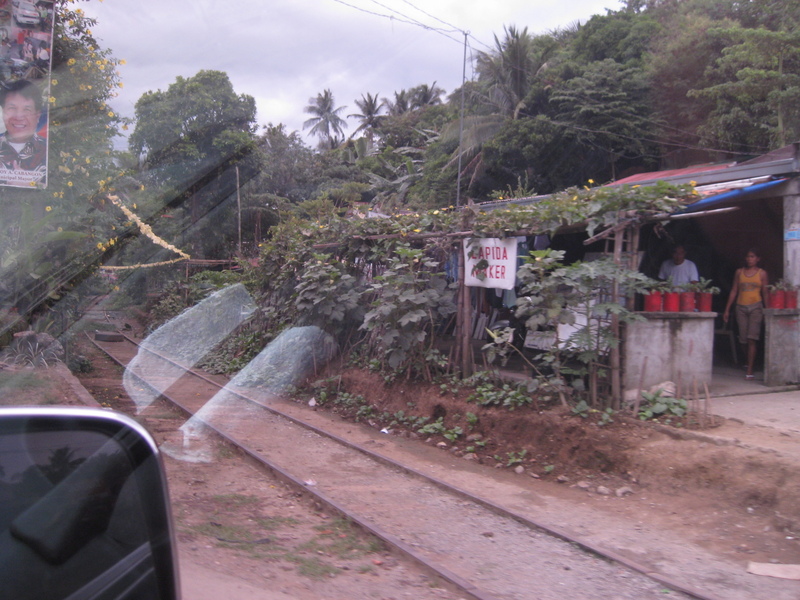 Traveling to and from the Bicol region back in 2009, I tried to trace the PNR’s Main Line South railway tracks that passed through the provinces of Quezon and Camarines Sur. Following are a few snapshots while traveling on-board our trusty Pajero. I don’t remember the towns where I took the photos mainly because I didn’t keep tabs about the info. However, I’m sure these can be retraced and recorded in another, future trip to Bicol. I hope readers don’t mind the reflections in some of the photos due mainly to our vehicle’s window tint. 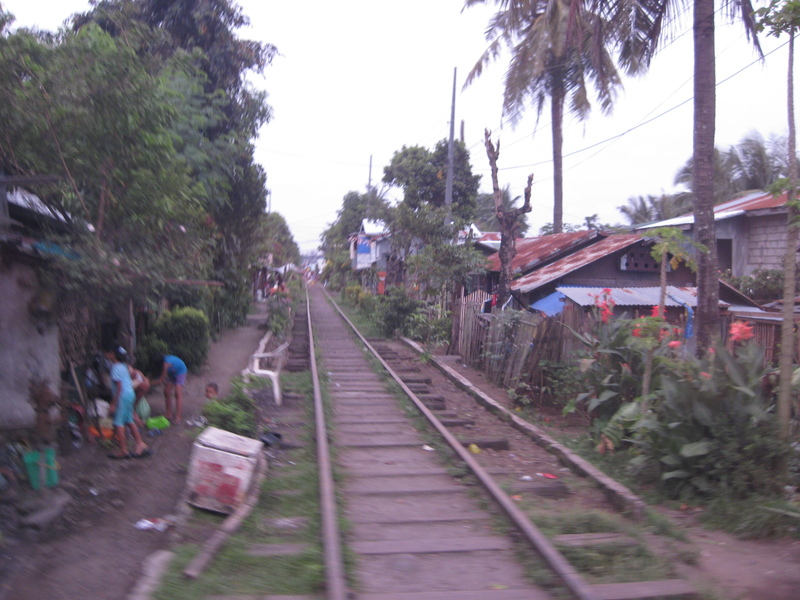 Railway tracks along a barrio in Quezon – while the rails are there, it seems many of the ties (sleepers) are either missing or already covered in soil. Note the houses that have encroached on the PNR ROW? They are well within the 30 meter ROW of the PNR tracks and will surely be affected should there be capacity expansion (read: double tracks) in the future. Tracks embedded on the national highway – while the old signs are still present in some junctions with roads, most are either unreadable because of wear or hidden among the posts and flora. These, too, need upgrading and should already include traffic signals and barriers to warn road traffic of an approaching train. The switch assembly on the right indicates diverging tracks probably in the vicinity of a station somewhere downstream from where I hurriedly took a photo. Railway tracks seemingly diverging from the highway – in this case, the photo strongly suggests the absence of ties to hold the tracks and prevent derailment. Much of what’s left of both MLS and MLN are in this condition and in the case of MLS requires intense rehabilitation to ensure the safety of travel. I can only imagine how trains should slow down during the wet season when the soil turns to mud in many sections. The signs are not so noticeable especially when motorists are driving quite fast along roads with very good pavements. I don’t think the railway signs comply with current standards of reflectivity and are already partly hidden from effective view by the trees and structures along the roadside. The tracks just ahead and crossing the highway are almost hidden due to the highway pavement. Asphalt overlays may tend to cover rails that are embedded on the highway. 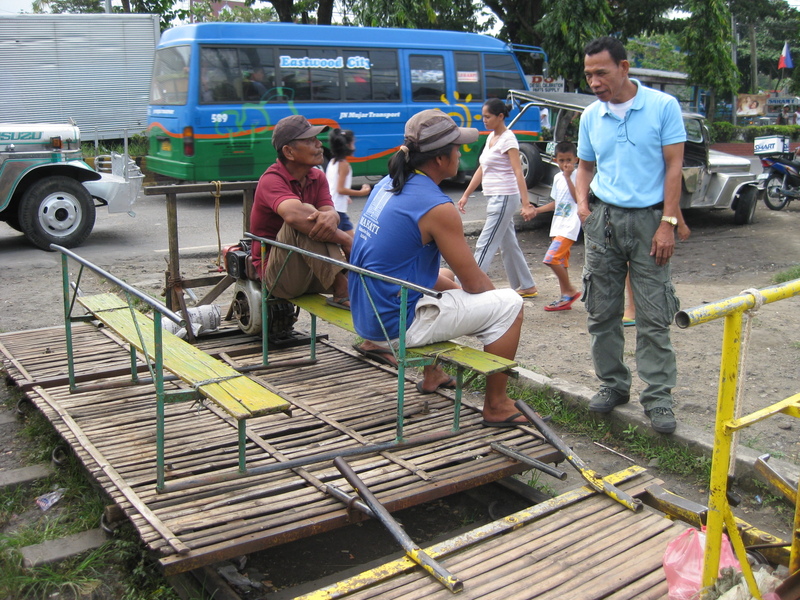 My first look at the motorized trolleys of Quezon – this photo shows what seems to be a terminal for two type of paratransit: the road-based tricycle (left) and the rail-based trolley (right). Being a convergence point for passengers, there are stores and eateries in the area. Note again the condition of the tracks where the wooden ties are still visible. 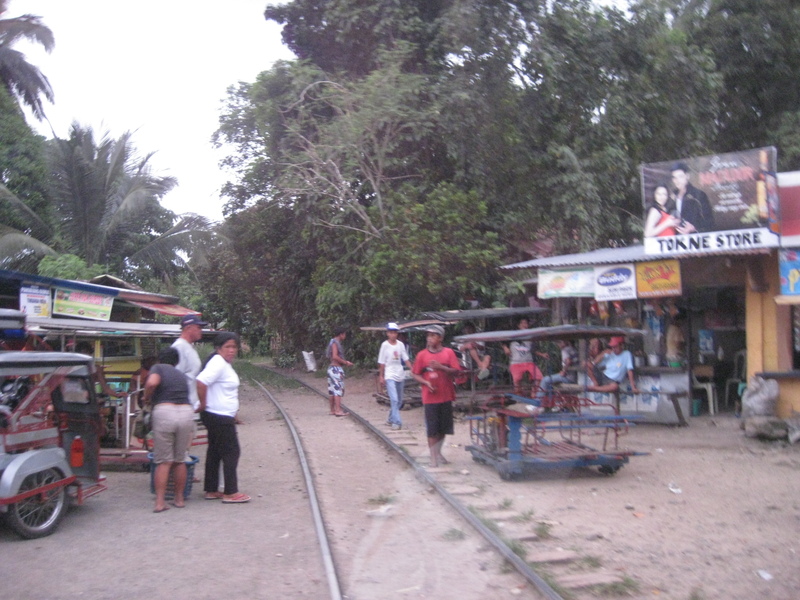 The photo above is my last snapshot of the railways prior to us using the bypass road on our way to Naga City. We also encountered heavy rains that prevented me from taking more photos during our drive. Thus, I was only able to take some more snapshots when we were already in Naga City. 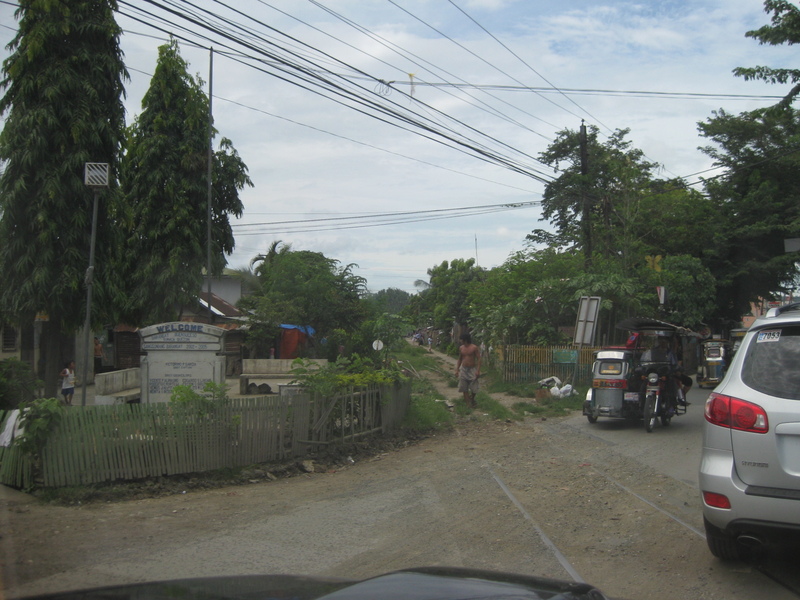 Rail crossing in Naga City – the signs again are obscured by other structures along the road. There are practically no safety devices at the time that could prevent crashes involving trains. 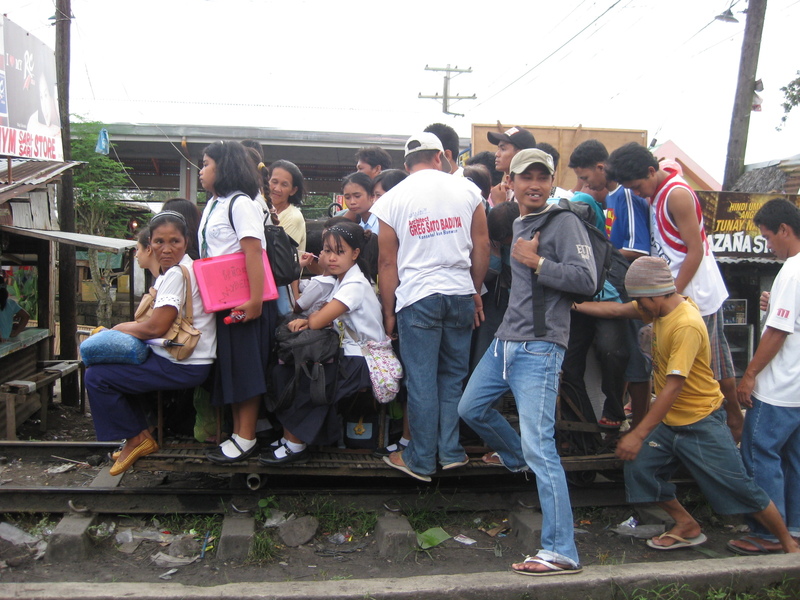 Of course, at the time, the train service to Bicol were still suspended so there were none that could have had conflicts with road-based traffic. 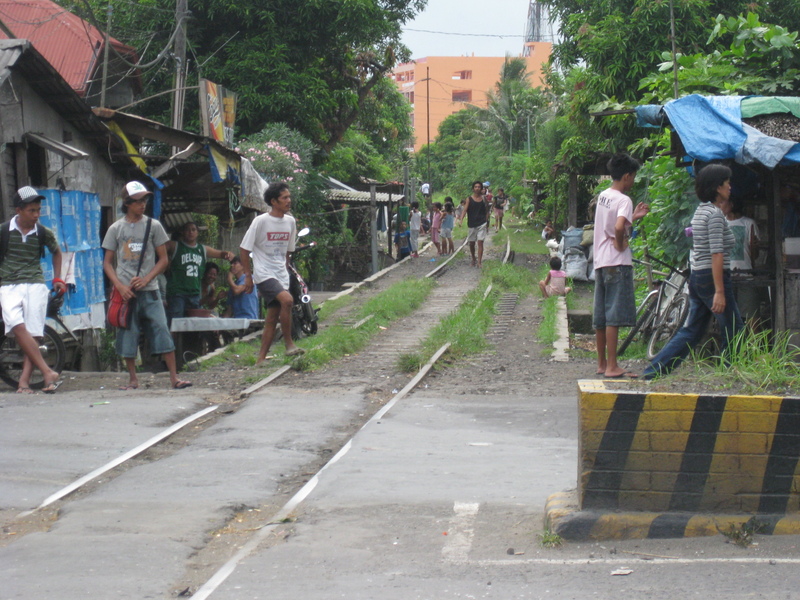 Railway tracks in Naga City – the tracks here seem to be in good condition despite the suspension of train services at the time. Noticeable too is the fact that while there is clearly encroachment on the PNR ROW, the houses have at least some space between them and the tracks unlike the case of Manila. 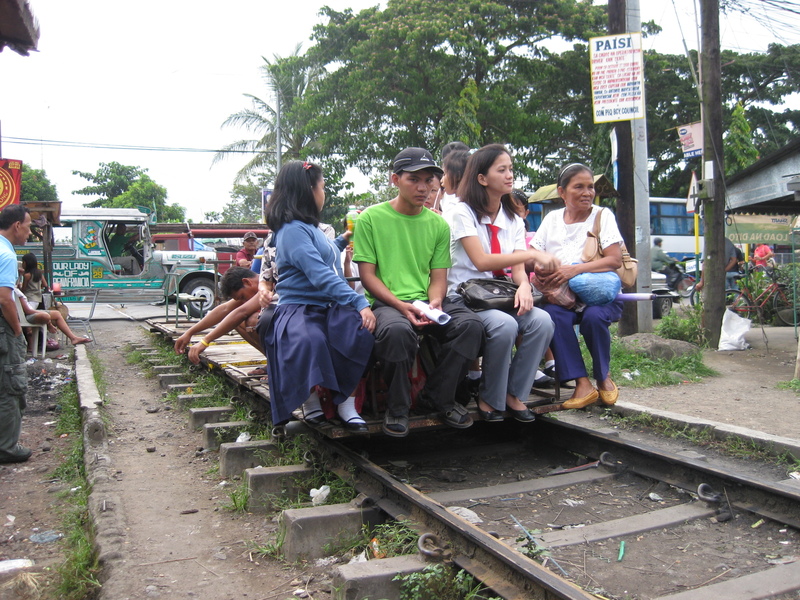 Note that in the Bicol region, the PNR uses a single track rather than a double track system. Future capacity expansion (and I’m crossing my fingers here) would require a double track system to permit increased two way traffic once the trains regain popularity. Typical issues concerning traffic flow along sections approaching or departing from the ramps of vehicular overpasses or flyovers include weaving. Simple observations will reveal that a significant number of vehicles, regardless of whether private or public, passenger or freight, big or small, have a propensity to change lanes before and after a flyover. Such weaving behavior is a consequence of driving behavior in this country where many drivers and riders often are unmindful of planning their trips as well as the proper positioning of their vehicles while using the road. Many drivers and riders seem intent only in bypassing points of congestion and do not have any respect at all for the rights of other road users as well as for the rule of law along highways and streets. I took the opportunity of taking a few photos after an interview conducted atop the pedestrian overpass along Commonwealth across from Puregold and near the Tandang Sora flyover. 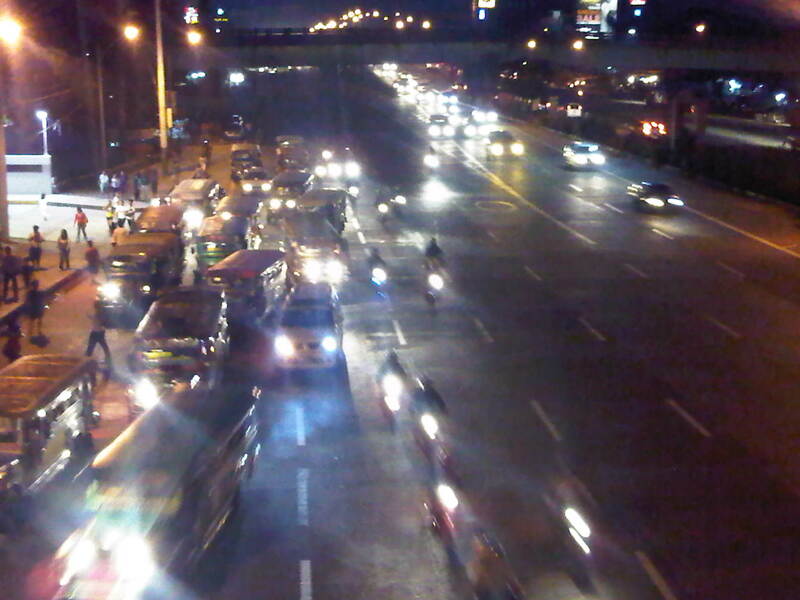 Below are a few photos taken during nightfall on Monday showing typical behavior of drivers and riders in the vicinity of the foot of the Tandang Sora flyover. 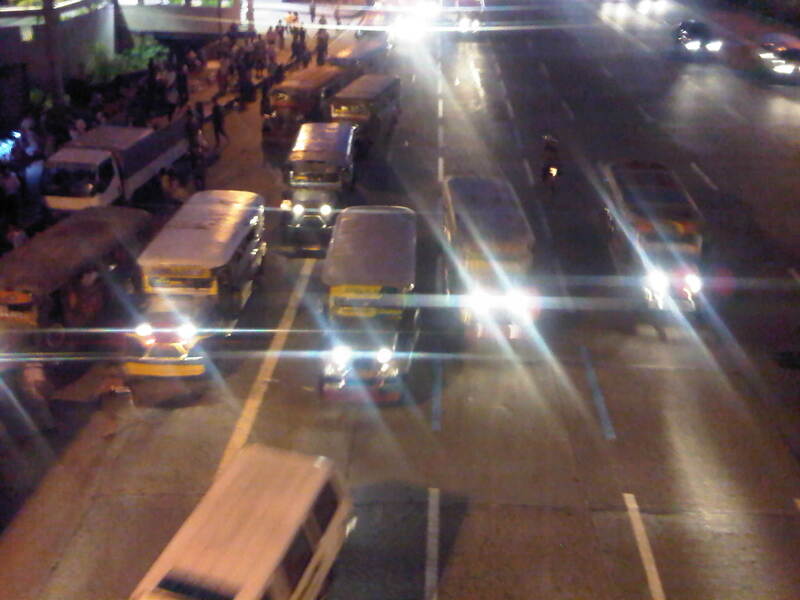 Jeepneys occupying five (5) northbound lanes of Commonwealth Avenue, including the lane designated for motorcycles (delineated by the blue lines) – Most public utility vehicle drivers in the Philippines seem to abhor queuing and the prevailing practice is for most of them to try to bypass others by encroaching along the middle lanes. Instead of a First In First Out (FIFO) discipline that is desirable for conventional public transport operations, its more like a Last In First Out (LIFO) state along loading/unloading areas. 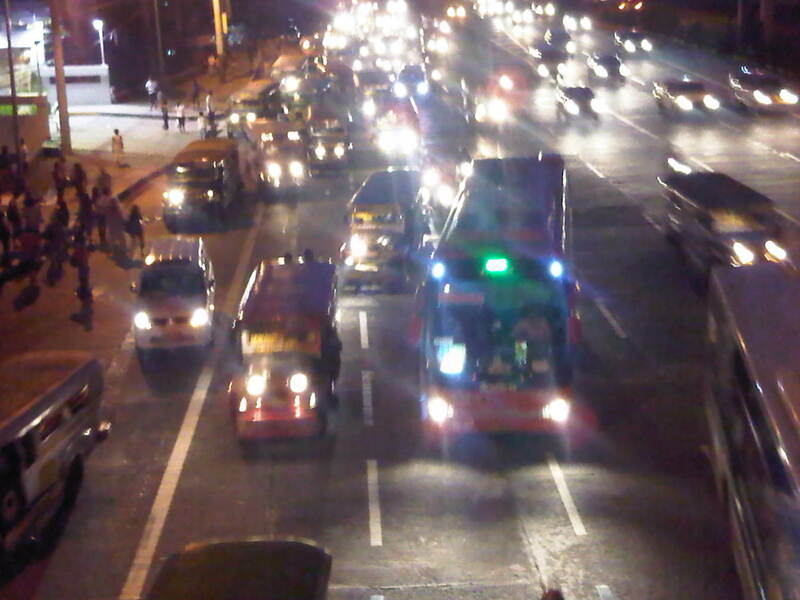 Buses joining the fray of vehicles in the same area – Note that practically 4 to 5 lanes of Commonwealth are occupied by buses, jeepneys and AUVs, effectively blocking motorcycles from using the lane designated for them. Such behavior in the vicinity of the foot of the Tandang Sora flyover also influences private vehicles to shift towards the inner lanes of the highway and unto the path of vehicles descending the flyover. Motorcycles (they with the single headlights) using the 5th and 6th lanes of Commonwealth – riders have no choice in this situation where PUVs have occupied the motorcycle lane and behave as if they are the the only road users in the area. PUVs are observed as generally oblivious of the fact that road space is to be shared and basic courtesy is a requirement for smooth and safe flow to occur. As the traffic flow decreases, partly due to the control imposed by the traffic signal upstream at the Tandang Sora intersection, lanes become less congested – motorcycles are then able to return to their designated lane. The chaotic situation shown in the photos could have been prevented or corrected if enforcers were in the area to manage traffic. There were none in the area, and I only found a few of them a couple of hundred meters downstream apprehending riders where traffic is already free-flowing. I thought perhaps that instead of focusing on apprehending riders, these enforcers were better off trying to address the mess upstream of their position. It is always both frustrating and disappointing to see enforcers diligently doing their jobs in the wrong locations along our highways. And all too often, the drivers and riders they apprehend are not the ones guilty of constricting traffic or posing dangers upon other motorists. 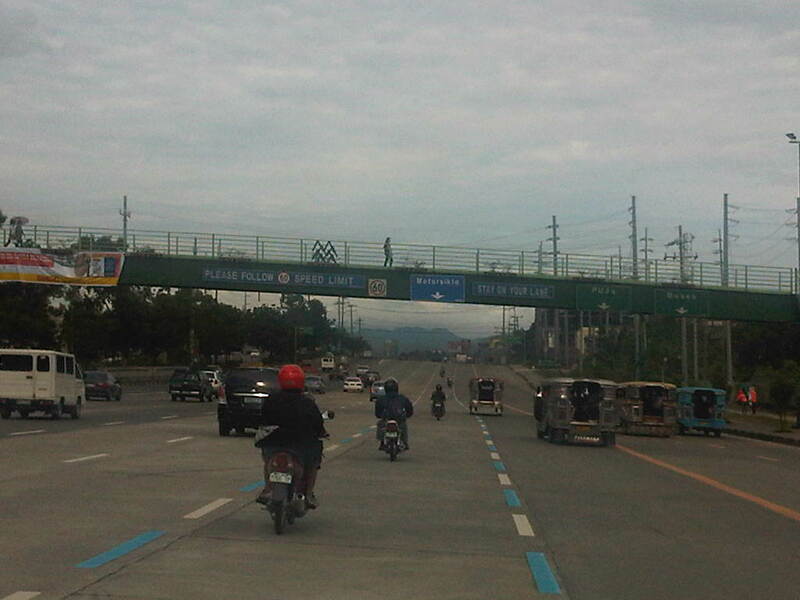 The Metropolitan Manila Development Authority (MMDA) recently established motorcycle lanes along Commonwealth Avenue in Quezon City and Macapagal Boulevard in Pasay City. The main intention is to reduce crashes involving motorcycles by attempting to segregate them from other vehicles in traffic. Following are a few photos I took this afternoon along Commonwealth where I observed the MMDA painting blue lines to mark the motorcycle lane. In this case, the lane is the 4th from the outer edge (shoulder) of the highway. 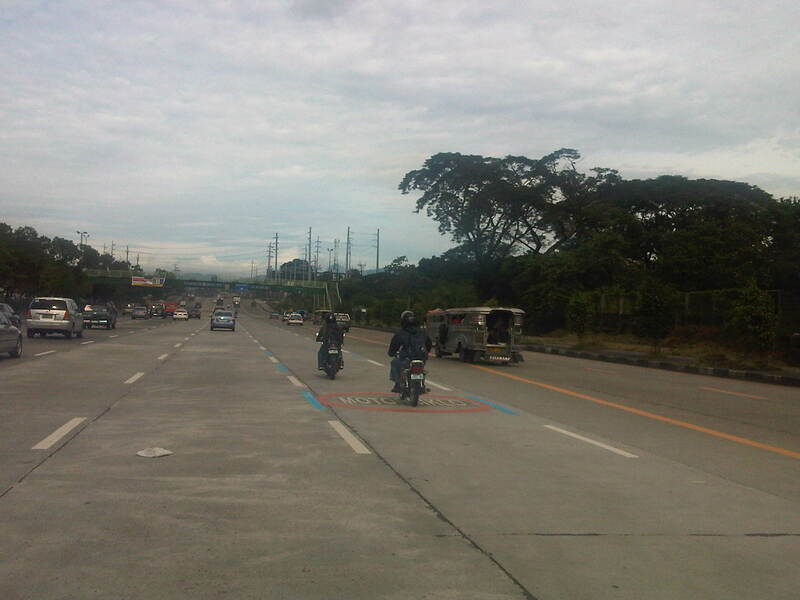 Newly painted blue lines mark the motorcycle lanes. Photo shows riders following the new policy, probably knowing that getting apprehended will lead to a 15-minute lecture on motorcycle safety. Such a penalty will only be applicable this week when the MMDA is implementing a dry-run of the policy. From Monday next week, the penalty would be a 500-peso fine for every apprehension. Pavement markings for the motorcycle lane along Commonwealth. 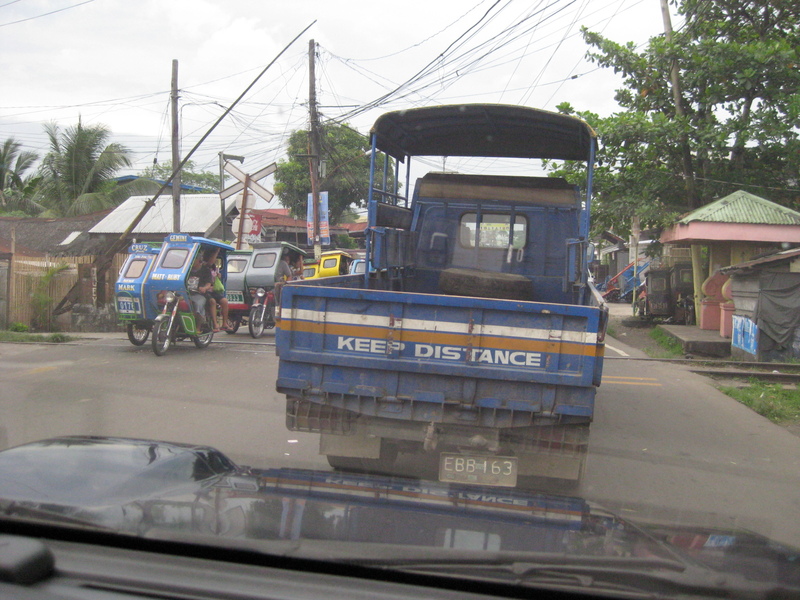 Note that the lane is quite close to the lanes designated for public utility vehicles like jeepneys and buses. This situation creates a high potential for the occurrence of crashes involving motorcycles and PUVs. Of particular concern is the behavior of PUVs, especially buses that tend to encroach upon the lanes to the left of the PUV lanes including the motorcycle lane. 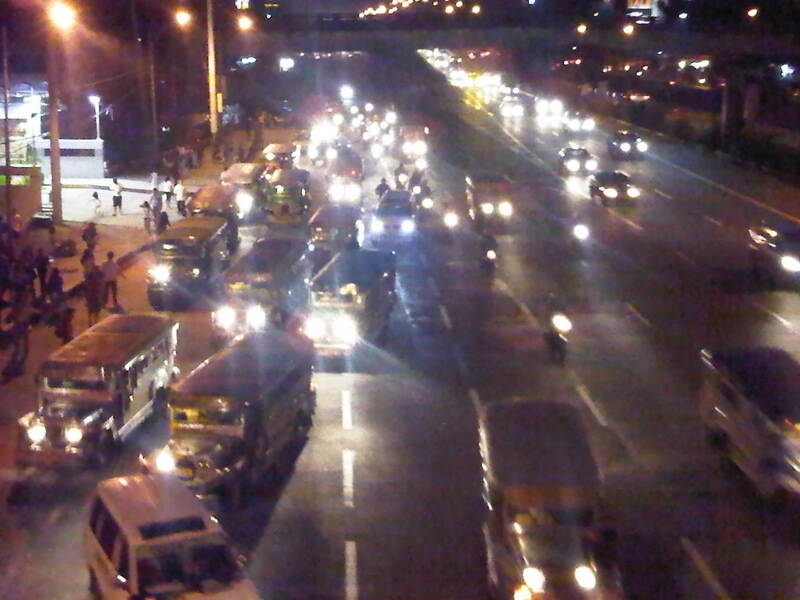 Another issue is the fact that private vehicles are allowed along the motorcycle lanes and not just for maneuvering. I share the opinion of riders that motorcycle lanes should be for motorcycles only.